1977T-SS is rated 4.8 out of 5 by 14. Touch it on. Touch it off. Whether you have two full hands or 10 messy fingers, Delta® Touch2O® Technology helps keep your faucet clean, even when your hands aren’t. A simple touch anywhere on the spout or handle with your wrist or forearm activates the flow of water at the temperature where your handle is set. The Delta TempSense™ LED light changes color to alert you to the water’s temperature and eliminate any possible surprises or discomfort. You can install with confidence, knowing that Delta faucets are backed by our Lifetime Limited Warranty. Electronic parts are backed by our 5-year electronic parts warranty. Rated 3 out of 5 by TouchyTouch from Touchy Touch The faucet is streamline and attractive and suits our needs. However, it was installed over a stainless steel sink. Because the bracket securing the faucet is touching the sink (underneath), when touching the sink or other hot/cold faucet, the beverage faucet will turn on/off. The issue, if it is troublesome, probably can be solved with some type of non-conducting material between the bracket and sink. We didn't bother, but are aware that the faucet can turn on/off multiple ways. Rated 5 out of 5 by Gilmorec from Reverse Osmosis faucet I bought this to go with the delta touch 2 technology kitchen faucet and it was well with it. The go perfect with each other and the reverse osmosis faucet doesnt complete with the bigger faucet with compliments it amazingly well. We initially bought a different osmosis faucet and returned it so we could by this one and we are so glad we did. We love the touch 2 technology, not touchy at all like some of the reviews we read. I cannot say enough positive things about this faucet. Rated 5 out of 5 by TMnorth from Fabulous!! We installed this about a month ago and it is great! The flow is fast compared to the water coming out of the fridge. You can almost fill two glasses in the time you are filling one from the fridge. My husband loves it as he fills his water bottles every morning for the day and it is a lot faster. It has an on/off button which is good because it is sensitive but I've only had to use the button a couple of times but I understand why it is there. The only issue if there is one is that the finish doesn't exactly match the pillar faucet we have (which is also fabulous) but that is understandable since we have had the faucet for about seven years now. Looks great on the counter that they look the same, same shape. Awesome and worth the money. Rated 5 out of 5 by bethdesign from I purchased this for a client, installed it and it looks and works great. Client is happy with this purchase. Rated 5 out of 5 by jimmy from Beverage Faucet I bought a few weeks ago it was very easy to install, looks great and adds a touch of class to our kitchen. Our neighbors were both impressed by the faucets looks and touch feature. Rated 5 out of 5 by Dave G from Good looking and Practical We purchased this as a reverse osmosis dispenser at our kitchen sink. It works great and we like the convenience of the touch dispenser which is a great improvement over the standard (Culligan) faucet that the unit came with. Easy install, good product information and instructions - 5 stars for the performance so far. Is this faucet completely lead free, or just &quot;lead free compliant&quot;? I am installing a RO system and require a zero lead faucet. Apparently &quot;lead free compliant&quot; allows the faucet to contain very small amounts of lead. Is this a zero lead faucet? Hello: Purchased this faucet to be used as a RO faucet only. My plumber claims that it is impossible to install it as an RO faucet. Please help, which RO system shall I consider buying to accommodate this specific faucet. Is this available in Champagne Bronze finish? special order? 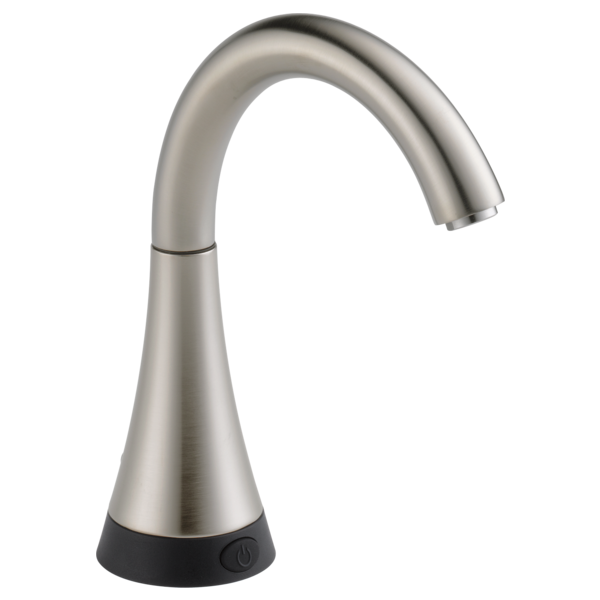 I want to match a your Trinsic faucet with Touch2O in Champagne Bronze. since they will be side by side I need them in matching colors. can this be special ordered in this color? Does the sensor on this beverage faucet model# 101357 work with the pressure of a Reverse Osmosis system tank? Is there a contemporary version coming out soon in matte black?! I'm doing a kitchen remodel and would like to purchase exactly this to pair with touchless soap dispenser, faucet, and pot filler. If so, would fitting be the same dimensions as this one? Is the optional AC power adapter available with the Beverage Touch? Is this compatible with any RO system? Or what should I consider with regards to finding an RO system compatible with this faucet? Will all under sink water filtration system connect with this faucet?